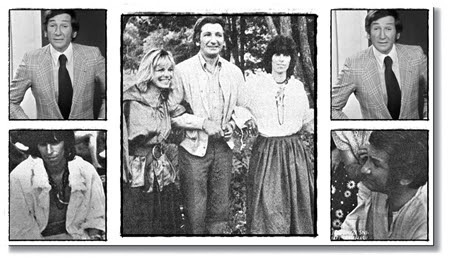 It just happened that even more popular person got interested in the project - Anita Pallenberg was cast as Katrina, so she and Relja played an on-screen husband and wife. - It was the very first time I met such a popular rock star, and I was amazed when Keith told me about his wealth - and the wealth of his colleagues. It seemed fantastic compared to our living standards. - There we were sitting, drinking, chatting, enjoying our evening with no fans nagging us, no disturbance of any kind. All of a sudden, in the middle of our meal, three men showed up and adressed me: "Relja, please give us your autograph. We're from Bosanska Dubica, on our way to Prague". And they didn't leave until they got what they wanted! Imagine the surprise at the table - my fellow Yugoslavs couldn't care less for the big stars who were dining with me! Keith got so enthralled with the atmosphere on the set that he asked for a role in the film. Director Schlöndorff offered him to be Relja's on-screen servant - Richards happily obliged. He didn't matter, as long as he, Anita and Relja could hang out together. - Anita and Keith were constantly high on drugs. "Just give it a try", they've been telling me over and over again. But I knew: if I get caught, I'd go to prison, so I told them: "No, let's wait until I visit you in London, then I'll catch up with you guys!" In the end, he did fly to London, where he found himself in Keith's luxurious mansion, surrounded by high stone walls with barbed wire on top. - The funny thing is, there were always dozens of fans, sometimes hundreds, right in front of the house, and they were all waiting for Anita to come out and handpick maybe four or five lucky ones to come inside - and clean all the mess after the parties! So, he finally sat down with Keith and Anita, and had his first hash cigarette. He felt nothing. Half an hour later - again nothing. Even after the second cigarette. They were all puzzled why it's not working on Relja! Soon they were in the car heading to some other rock star's party. - And then the drugs hit me! I stuck my head out of the window and started throwing up all over London. The same thing was happening at the party, which I spent mostly with my head in the loo. Anita was kind enough to take me to a hotel. I felt so sick I thought it's gonna ruin my vacation, but when I woke up next morning - I felt fresh as a baby!